For too long the author has overheard comments of this nature. Being an engineer and project manager for decades—who unashamedly prides himself on being an ambassador for both his professions—and a public speaking and storytelling aficionado, he acknowledges a shortcoming that must be tackled. Necessary Bridges has been created primarily to persuade project managers, engineers, IT professionals—and all STEM professionals—to make a 100% commitment to acquiring expertise in public speaking and storytelling. Because public speaking and storytelling expertise = communication and leadership prowess. Because public speaking and storytelling prowess = enriched human connection. Necessary Bridges is both and easy read and a long-term study course. It evangelizes public speaking and storytelling. It provides guidelines and tools. It points to multiple external resources. It requires the reader to create a project charter and complete a wide range of exercises. It advocates long-term planning. It encourages hard “time-and-money” commitments. It encourages syntopical reading. It urges the reader to seek out mentors. Necessary Bridges unapologetically evangelizes lofty vision and soaring rhetoric that is firmly grounded in pragmatism and reality. It contains insights from emerging science. It debunks the nonsense of the fear of public speaking (glossophobia) is greater than the fear of death—once and for all. It investigates the origins of glossophobia and offers numerous approaches to manage it. Necessary Bridges advocates boldness when participating in public speaking. It lauds excellent life habits. It studies ways to acquire expertise and offers a practical approach to get there. Necessary Bridges divides public speaking and storytelling into orthodox and unorthodox competencies, and encourages mastery in both. It suggests that public speaking and storytelling skills are “connection” and “flow” enablers. Necessary Bridges may not provide best value for readers who firmly believe that quick reads and smart short cuts alone can lead to expertise. 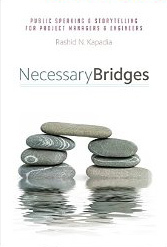 Buy your copy of Necessary Bridges at Amazon.com.